Angelia and I are back – it is always weird to be gone on a weekend but I heard it was a great worship gathering last week as we suffered for Jesus in San Diego! 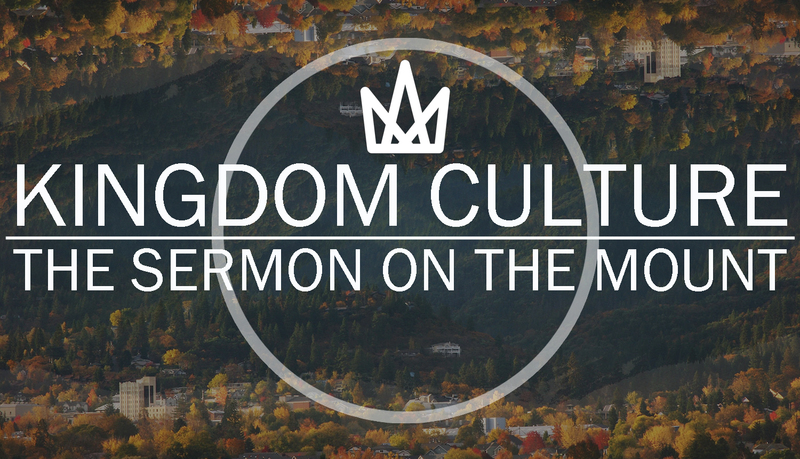 We are continuing in our series, Kingdom Culture, as we explore the Sermon on the Mount. So far, Jesus has spoken about a Christian’s character, and of the influence he or she will have in the world if they exhibit this character and of this character bears fruit in “good works”- works of obedience to God’s voice. He now proceeds to define further this character and these good works in terms of righteousness, which was a primary theme in Pastor Dan’s message last week. Clearly this idea of righteousness is important. If you have your bibles or the bible app on your device, you can turn to Matthew 5:21-32. That is where we will be focusing in on today. An interesting correlation in the Sermon on the Mount is Jesus begins in the Beatitudes, speaking in third person (“Blessed are the poor in spirit…”); he continued into the second person (“You are the salt of the earth”); and then to the authoritative first person (“I say to you (18) or I tell you (20)). As Pastor Dan shared last week – there are 6 applications of higher righteousness that are introduced by the phrase, “You have heard…” referring to a command in the law of Moses. Today we will touch on 3 of them. In all 6 instances then, Jesus adds, “but I say to you…” The Greek says ego de lego hymin. Sounds like lego my ego! But it’s important to point out the sometimes glossed over meaning. The Greek lego means “I say”. The ego is “I” and is not only added here but is placed in the first clause – the emphatic position in the Greek sentence. So, this sentence is read, “but I say to you. Jesus is declaring His divine authority to speak to us about greater righteousness than the strict law followers, the Pharisees and Sadducees. It is fair to say that righteousness is different than following the rules, which the religious rulers of Jesus’ day were very good at. Starting at verse 21, Jesus gives the first application of righteousness with anger. 21 “You have heard that our ancestors were told, ‘You must not murder. If you commit murder, you are subject to judgment.’ 22 But I say, if you are even angry with someone, you are subject to judgment! We could all agree I hope that murder is wrong. But Jesus is pointing to something much deeper. Murder is the law, but the root of murder is anger. Anger of pride, arrogance, hatred, cruelty, and revenge. If you are angry with someone, you have murder in your heart. Anger and insults is the root of physical murder and lead to the murder of someone’s thoughts, feelings, character, and value. Murder is a horrible crime against the law but anger and insult are horrible crimes against a fellow human being and come from unrighteousness. The second application of higher righteousness deals with the seventh commandment, do not commit adultery. 27 “You have heard the commandment that says, ‘You must not commit adultery.’28 But I say, anyone who even looks at a woman (or man) with lust has already committed adultery with her (or him) in his heart. Just as with murder, the religious leaders in Jesus’ day were teaching a narrow view of the commandment (law of Moses) and a broad definition of sexual purity. There is a correlation between our eyes and our hearts. Job claimed that he had learned this… “I made a covenant with my eyes not to look with lust at a young woman. If I have strayed from his pathway, …or if my heart has lusted for what my eyes have seen, or if I am guilty of any other sin, …If my heart has been seduced by a woman, or if I have lusted for my neighbor’s wife…” he would acknowledge that he had sinned and deserved the judgement of God. Thankfully Job had not done these things because the control of his heart was due to the control of his eyes. Being righteous is more than simply not going and sleeping with another man or woman – it is not looking and thinking about another person outside of your spouse with sexual thoughts. It is those thoughts that can take root and lead to the physical act. Therefore, it’s those thoughts that are unrighteous. Jesus continues to the third application of righteousness and speaks of divorce. I think we would be well served to think of this passage in the light of the desire of Jesus for fidelity in marriage. This is a brief segment of the vast scriptural teachings on marriage, relationships, and divorce. Jesus is speaking on this topic because there was a current controversy about divorce between rival rabbinic schools of Hillel and Shammai. Rabi Shammai took a rigorist line and taught that the sole ground for divorce was some severe marital offence. Rabbi Hillel held a lax view and taught that a man could divorce his wife for any cause – something unseemly – including a wife’s trivial offenses. Perhaps it was being an incompetent cook or burning her husband’s food, or maybe he lost interest in her looks. These types of things could justify divorce according to Rabi Hillel’s teaching. The Pharisee’s questioned Jesus in Matthew 19 on divorce and their framing of the question leads us to believe that they adopted or at least were attracted to Rabbi Hillel’s lax view on divorce. They wanted to know whose side Jesus was on in the current debate. Would he side with Rabbi Shammai or Rabbi Hillel? Does Jesus belong to the school of rigorism or of laxity? Jesus does not answer the question as they expect but asks a counter question, referring then back to the book of Genesis because He is concerned about the institution of marriage, not the grounds for divorce, which is the focus of the Pharisees. The religious rulers were concerned with defining the reasons for divorce and then enforcing that as a command, holding the institution of marriage lightly. Jesus on the other hand, takes marriage so seriously that he declares that all remarriage is adultery except when divorce is for only one reason – serious sexual sin. But the more important issue is that the concession of divorce by Moses was because of people’s hardness of heart. 8 Jesus replied, “Moses permitted divorce only as a concession to your hard hearts, but it was not what God had originally intended. God never intended a man and woman who have been married to ever separate. The Pharisees are focusing on how one can be divorced and Jesus is focusing on how one can be reconciled. Some of you in this room are divorced. Some are children of divorced parents. If we have not been personally touched by divorce we surely know someone who has. It is not my intent to unpack the teachings on divorce this morning but to emphasize that Jesus desires for us to see marriage as a highly valued, God-created union and that we should do everything we can to be reconciled where there is marital strife. But all of us hurt and have been hurt and God’s grace is sufficient for us. When we look at anger, lust, and divorce there is a common theme. Jesus is trying to help us understand that this higher level of righteousness, one that is not rooted in the law, comes through purity. Righteousness comes from a desire to please God, not just follow rules on a page. It is rooted in relationship not religion. It is in that relationship that Christ works within us that purifies us, fills us, and makes us righteous. Righteousness is imputed to us when we say yes to Jesus, but purity and holiness is shaped in us over a period of time. 2 Corinthians 6:6 – We prove ourselves by our purity, our understanding, our patience, our kindness, by the Holy Spirit within us, and by our sincere love. Christ is in the process of shaping us, purifying us, making us holy. Proverbs 16:24 – Gracious words are a honeycomb, sweet to the soul and healing to the bones. But words also have the power to destroy and discourage. Proverbs 15:4 – The soothing tongue is a tree of life, but a perverse tongue crushes the spirit. How often do your words create & inspire? How often do they destroy or discourage? Psalm 86:11 – Teach me your ways, O Lord, that I may live according to your truth! Grant me purity of heart, so that I may honor you. Proverbs 17:3 – Fire tests the purity of silver and gold, but the Lord tests the heart. In Soul Detox, Craig Groeschel summarizes well: o Creative words create. Destructive words destroy. Hurtful words crush. Helpful words build up. Toxic words poison. Soothing words heal. Faith-filled words bring life. Faithless words bring death. One of our passages today talked about that if you are angry with someone, you have murder in your heart. It is from our heart that comes words that can kill and destroy or words that bring life and light to those around us. God wants to purify our hearts so that our words are full of grace and truth. Philippians 4:8 – whatever is true, whatever is noble, whatever is right, whatever is pure, whatever is lovely, whatever is admirable—if anything is excellent or praiseworthy—think about such things. As murder includes thoughts of anger and words of insult, so adultery includes lustful looks and imagination. Another passage this morning calls us to have minds that are clean, thoughts that are pure and honoring to God. Even if we do not act out the sin, we have already sinned when we have unclean thoughts about another person. Cain and Able brought a sacrifice before the Lord in Genesis 4 but the Lord rejected Cain’s offering because he brought it with the wrong motives. His deeds by all accounts were in accordance with the law but his intentions were impure. He didn’t bring God his very best. God sees us and sees everything. We must evaluate our motives. Prior to Jesus’ teaching on murder, adultery, and divorce, He taught them about the key to purity – the key to be able to live a holy life. A relationship with God is far more than righteousness. Righteousness is imputed when we respond to His grace. Holiness is developed over time as we are formed into greater Christ-likeness. Christ desires for us to live a life of holiness. Holy is what God is. “Holy, holy, holy is the Lord God Almighty.” Pure and clean without blemish – Holy – is what God is. God wants us to be like Him. God is holy – God is pure – and God wants us to be holy and pure also. And this life is made possible because Christ came and fulfilled the law. Literally, he “filled full” the meaning of the Old Testament. Christ is the key that unlocks the Scriptures and unlocks holy living. One can assume that there were those who were concerned about this new teacher named Jesus that he intended to destroy the law or the prophets. Jesus clearly declared that he was here to not destroy but to fulfill its commands and promises, it precepts and prophecies, its symbols and types. Christ fulfilled the law just as he fills our heart, our needs. We are no longer under law but under grace, which requires more of us. What Jesus is teaching us today is that he is concerned with the condition of our hearts. Are we merely looking for excuses to get out of our marriage, to justify our wandering eyes, or our hurtful words? Or are we really seeking to be a person of patience and grace, striving for reconciliation in our relationships, and putting safeguards in place for our hearts and our eyes? Are we being transformed into people who are more Christ- like? Is Christ purifying us and making us holy? Jesus is so concerned about reconciliation that he tells us that we need to halt our worship of him to get right with someone. Temple and you suddenly remember that someone has something against you, 24 leave your sacrifice there at the altar. Go and be reconciled to that person. Then come and offer your sacrifice to God. Notice that he doesn’t say if you have wronged someone but that if you know that someone has something against you. You have a responsibility to seek reconciliation. Family For the Love of Snot!